I imagine that a good portion of our readership has most likely heard about Village Hardware at some point over the last 39 years. Especially those who live down the GW Parkway and in the Fort Hunt area. This family owned business has been a staple in the community since 1979. I wasn’t able to connect with the owner, Larry Gray, but did have a nice conversation with the staff on duty at the store the day I was there and thanks to the wonders of the “interwebs” I was able to glean some additional valuable information. The Village, as it is referred to by regulars, is a culmination of Gray’s time working with his father in the construction business and learning the tools of the trade as a young man. The knowledge he gained being hands-on in the construction business was a major asset when he decided to start his own business. He has applied everything he learned in those early years to running his business to this day. Offering a high quality product with personalized service. Over thirty years later, that single promise has been elevated to an art form, backed by decades of experience, an expansive range of expertise, and most of all, a wonderful willingness to help. Rest assured, if you have a question, the Village has an answer. Let me tell you, they do have high quality products and LOTS of them. Everything you would ever need for any home and/or garden project. If you can’t find what you need in this place, you might really not need it. From the tiniest screws and nails to a larger than life Weber cooker, they have it all. The interior photos that accompany this write up don’t do it justice. They even sell reading glasses in this place. When I was doing my “walk about” in the store, I didn’t see any of the grills and outdoor cookers so I went out front and looked again and didn’t see any. I inquired at the checkout counter and one of the very helpful staff members took me down to the basement of the store. Whoa! There is everything you need and some stuff I bet you haven’t even thought of down there. 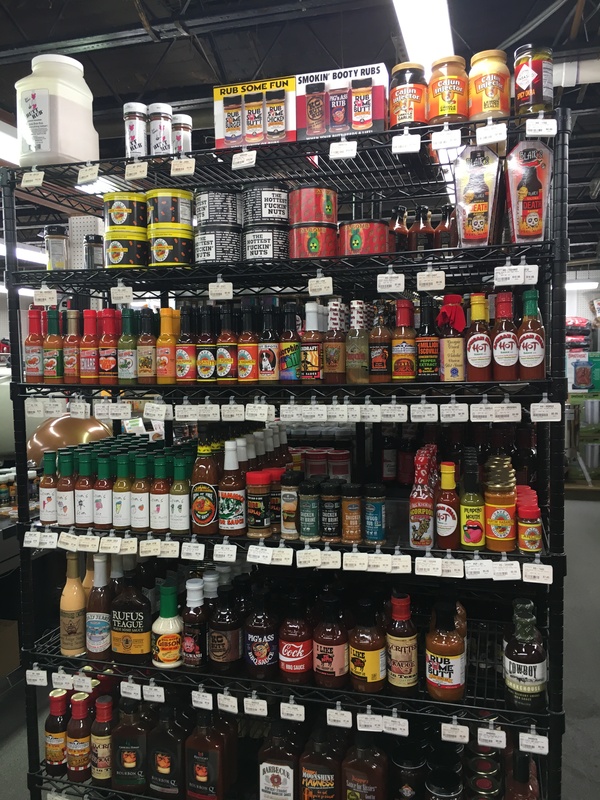 They even have a huge shelf of hot sauces! Among the product brands on hand are Weber (BTW they are the top Weber dealer in the area), Big Green Egg, Stihl, Honda, Yeti (the coolest of the coolers), Briggs & Stratton, Benjamin Moore, and Toro. These are just the major suppliers. Check out the website for a complete listing of products. Speaking of which, you can order from the Village online but that takes the fun out of spending time in the store with the people and just looking around. Before I left the store I talked with Marty – another helpful Village team member – about their customer service. 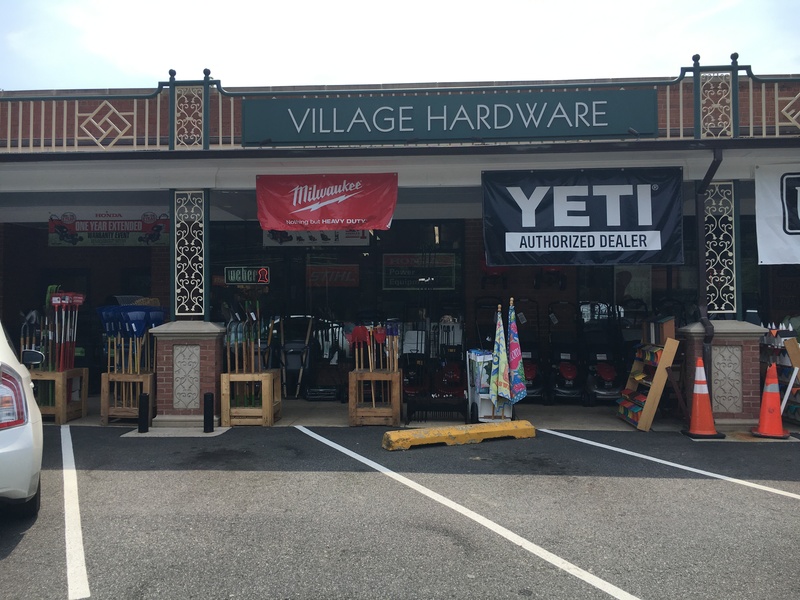 Over the course of the last few years, I have heard stories about the stellar service that Village Hardware provides to their customers. They have a particularly good reputation when it comes to the service provided when you purchase one of the outdoor grills/cookers. They deliver it, assemble it, train you in its use (actually have it up and running) and the best part….they take away your old grill. All at no additional cost. They also stand behind their products and make sure that you are satisfied with your purchase. You don’t find this kind of service anywhere near a Home Depot or a Lowes, that’s for sure. If you’ve never stopped by this store or haven’t been by in a while, you might want to do so and see what they have going on. 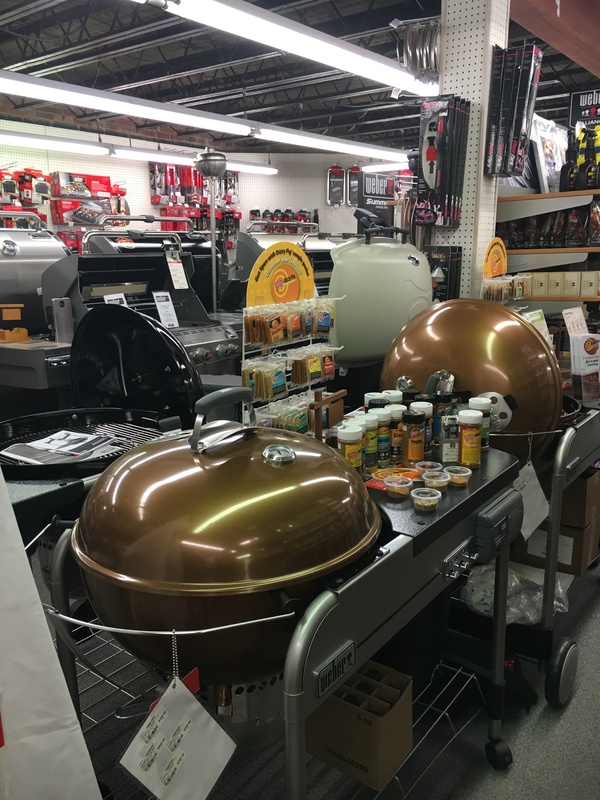 You can always get the brand new Weber Big Dog Daddy Grill or the HUGE Kamado Grill in time for your 4th of July celebration!